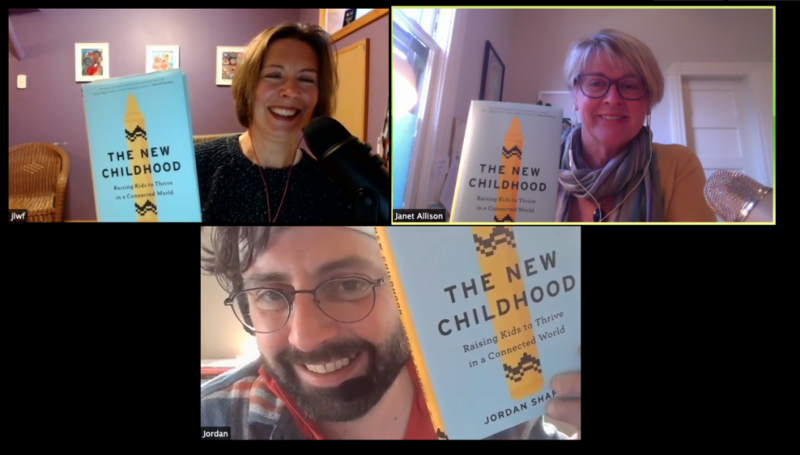 Janet & Jen had very different reactions to The New Childhood: Raising Children to Thrive in a Connected World, by author and educator Jordan Shapiro. Jen loved it. Janet has some, uh, questions. And concerns. So, we decided to talk to the author. Jordan was happy to talk with us. He’s an assistant professor at Temple University who specializes in game-based learning, digital play and screens. As a senior fellow for the Joan Ganz Cooney Center at Sesame Workshop, he coordinates research and advocacy around digital technology and playful education. He’s also a dad of two boys, ages 11 and 13, so his knowledge of screens and digital play is more than academic. Like all 21st century parents, he grapples with technology and parenting every single day. Our society, he says, is changing. The digital age is here, and interconnected technology is changing everything — how we work, relate, socialize, play, learn and plan. The pace of change has been fast and furious, and as a result, a lot of adults are feeling overwhelmed and somewhat fearful. But fear of technological and societal shifts won’t help us teach our children to use the tools of the digital age in intentional, ethical and moral ways. To effectively parent today’s kids — and prepare them for the future — we must open our minds, get clear about our values and talk to our kids about their digital engagement. Digital note taking vs. hand-written notes — what does the evidence say? Love your podcast. I have listened to most episodes and they have given me a lot to think about. I just listened to the screens episode. And Jordan makes important points that we as parents need to adapt and learn to role model behavior with screens. But one thing I didn’t hear (I have not read the book) is that there are real physical ailments from too much screen time. I am a children’s optometrist and I have this type of conversation every day about screens with parents. I won’t get into all the literature here (I’d be happy to send you science links if you want), but the rates of nearsightedness and visual focusing problems and eye discomfort are all sharply increasing around the world. While this category of conditions called “Computer Vision Syndrome” used to be limited to office workers and programmers, they are now commonplace in kids. I am not trying to be alarmist. I know this is one tiny section of the conversation. I do not think that every child is susceptible to these issues, but both from research and from parents, I am absolutely convinced that the younger kids are the less screen time should be allowed, the larger the screen the better (TV is better than tablet better than phone) and the more outdoor time and unstructured play the better. Just more info on an important topic.